Do you like a uniform look in your kitchen? 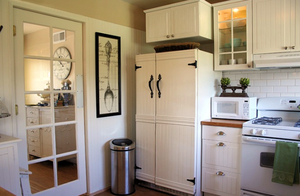 Are regular refrigerators an eyesore to you? Do you view them as space-hoggers? 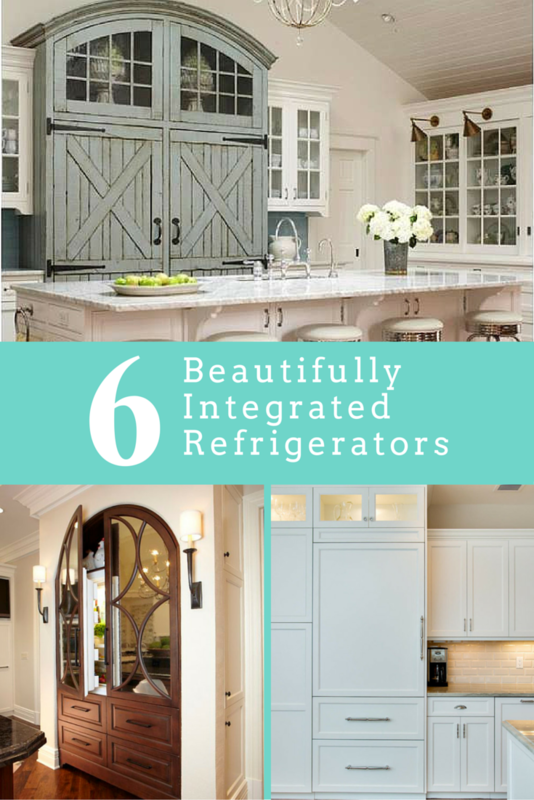 If any of these are true to you, you may be interested in integrated refrigerators. We’ve compiled a short list that have been camouflaged, built-in, hidden, etc. for your designing pleasure. This refrigerator shared by Caden Design Group takes classy up a notch with built-in mirrors, wooden drawers, and half-circle molding. The special arch design completely hides the existence of the fridge by using lines not typical of refrigerators. The result is a refrigerator that feels more like a fancy armoire than a home appliance. If you love to go antiquing and refurbish furniture, you’ll appreciate this refrigerator shared by ACF China, who specialize in Chinese antiques. 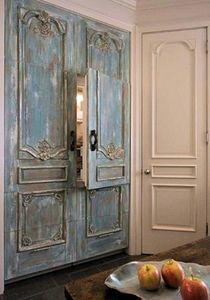 They wrote a guide to Chinese doors and door panels, and shared this beautiful door that was salvaged and refurbished into refrigerator door panels. They don’t completely blend in with the rest of the kitchen’s white cabinets, but it’s a unique way to display an art form or style appreciated by the homeowner. This barn door refrigerator from Beautiful Kitchens Magazine (Spring 2010) takes a similar approach as the Antiqued Refrigerator. 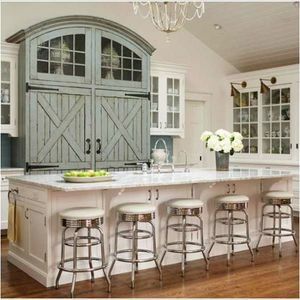 The owners of the home loved the look of distressed barn doors and decided to integrate them into their kitchen design. 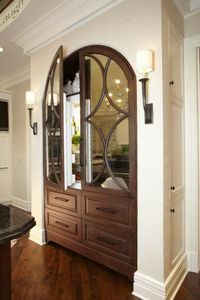 The result is a gorgeous statement piece that acts as both a cover for the refrigerator and additional storage with the cabinet above. If you have a large island in your kitchen or a small kitchen where you want to get creative with storage, consider installing a drawer refrigerator. There are multiple styles to choose from. 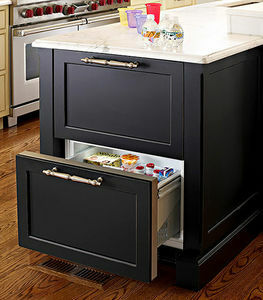 This island refrigerator drawer shared on Traditional Home is designed to blend in with the island’s cabinetry. It’s made so well, you’d never know it was there until it was opened. If you’re looking for other undercounter refrigerator options, check out this article from Home Edit. Not all of the refrigerators they share are as concealed as these drawers, but they have some very nice examples that will help save space in smaller kitchens. One of the perks of having your kitchen renovated is that you can often purchase panels for the front of your refrigerator that will make it blend with the new cabinets. This kitchen from Design Line Cabinets is a good example of that. The refrigerator looks like an oversized cabinet along the wall. 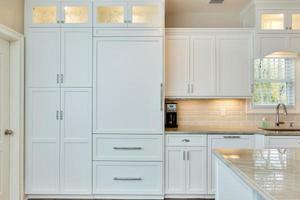 If you’ve had cabinets installed in the past 5 years, chances are that you may be able to find the panels online or from your original supplier. It doesn’t hurt to look. If you’re on a limited budget and feel brave enough to do a DIY project, Jennifer at The Old Painted Cottage shared her makeover of an old 1970s fridge. She extended the wood beadboard paneling they installed on her kitchen walls to the exterior of the fridge. She even added some decorative hardware to give it that old cottage feel. It doesn’t fit all kitchen designs, but is one way to think outside the…refrigerator box? Have you come across a neat way of camouflaging a refrigerator? Share it in the comments!